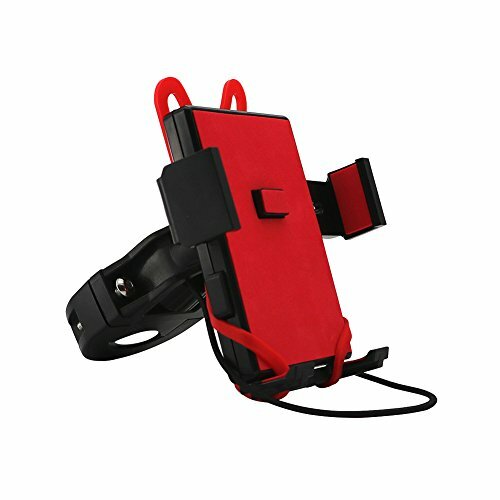 Suitable width of device: 2"- 3"
★1-TRIPLE PROTECTION: Durable non-slip silicone and stretch belt design, holds phone extremely tight in bumpy road. Soft contact surfaces, protect mobile phone sliding wear. ★2-ENGINEERING ABS PLASTIC MATERIALS: Made of premium ABS material and 304 stainless steel, anti-drop wear, provide the best phone protection while you are riding. ★3-EASY ONE TOUCH: Simple operation, auto-locking bike mount, one touch mounting operating system. Lock and release the device with just a push of a finger. ★4-SMART 360° ROTATION DESIGN: Fully adjustable for quick portrait and most appropriate landscape view. ★5-UNIVERSIAL COMPATIBILITY: Holds phone up to 3" wide, suits for iPhone x / 8 / 7 Plus / 7 / 6 Plus / 6, Samsung Galaxy S7 / S6 / S5, 4.5"-5.5" mobile phone etc.. Wide usage for road bicycle, mountain bike, motorcycle, gym, stroller, desk stand. If you have any questions about this product by ELShen, contact us by completing and submitting the form below. If you are looking for a specif part number, please include it with your message.